How big are the yurts and do they have partitions inside? Our large yurts are six meters in diameter and sleep up to 5 people (6 with an additional folding bed). The smaller yurts are 4.5 meters in diameter and sleep two plus a travel cot if required. The large yurts have fabric partitions allowing some privacy to be created. The partitions can be drawn back in the day to give a more spacious feeling and to appreciate the yurts structure. What do I sleep on? A comfortable full size bed just as you have at home. Furthermore the large yurts have a king size bed. All the beds have good quality duvets and extra blankets for Spring, Autumn and Winter breaks, although the log burner will keep you cosy! Do I have to supply bed linen? We supply bed linen at a charge of £5.00 per person per stay to ensure all our beds stay clean and fresh. Your linen pack will be found in your yurt on arrival. You will receive a starter pack of wood and kindling in your yurt to get you going on your arrival. We do supply wood which is stored in the wood shed for you to chop and use in your log burner. We are always happy to help you with this. Is there any traffic noise? The simple answer is yes. We are approximately half a mile from the A38 which makes your journey to Yurtcamp and access to the area’s many attractions very easy. The vast majority of our guests do not have a problem with the level of traffic noise, but if you are looking for perfect peace then regrettably we cannot recommend a stay with us. The Time Out Guide to Camping’s “Our Favourite Sites in Britain” wrote the following as their only criticism of Yurtcamp. “The proximity to the A38 means there is a faint but persistent whirr of traffic”. Yes. There is good signal at Yurtcamp. There are also several points to charge your phone/tablet. Yes. The Woodland Café has Wi-Fi access. How do I see at night? Each yurt is lit by solar light or safe lanterns, and candle holders. You do however need a torch for going walkabout. We have a large shower and toilet block, centrally located , which has lots of hot showers, hair dryers, mirrors and toilets for ladies, gents and the disabled. There is also a second toilet block close by, a washing up and laundry areas with rotary washing lines. What is provided inside the yurts? Everything you should need except your groceries. A full inventory is sent to you on completion of your booking. Cooking is on a two ring camping gas cooker, or the log burner, inside your yurt and outside there is access to a fire pit complete with a trivet which will take the pots and pans provided. We also hire out Dutch ovens. Can my friends come and stay with me for a few days? If you have friends or family who are in the area they are welcome to visit Yurtcamp in the daytime but an overnight stay incurs additional charges as per our booking conditions. If you need more space for your visitors by all means book an extra yurt, although this is subject to availability. Do you cater for group bookings? Outside school holidays we welcome group bookings, parties, wedding events, corporate bookings and most other group events. Please ensure you book early so we can accommodate your party in adjacent yurts. However we do not allow all male groups. Sorry but pets are not allowed on site. However, we can recommend local kennels. Is a holiday at Yurtcamp suitable for very young children and babies? Lots of our guests come to us with the very young. Babies and toddlers love living in the yurts and being close to nature. We have a supply of travel cots which are ideal for small children. We can also supply high chairs and pottys if required. Please reserve when you book. Are the cars parked on site? Yes, we have large car parks on site. For safety reasons cars are not allowed in the main yurt or woodland area. You can transport your luggage to your yurt in our large luggage barrows. Can I lock my yurt? For your peace of mind all our yurts have solid wooden doors that lock. However, due to the outdoor nature of the holiday we would suggest you leave unnecessary valuables at home. Will my Sat Nav get me to Yurtcamp? No your Sat Nav will get you lost! Google Maps works very well finding Yurtcamp, Staplehill Road NOT the postcode. 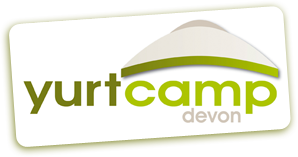 Yurtcamp Devon Frequently Asked Questions.